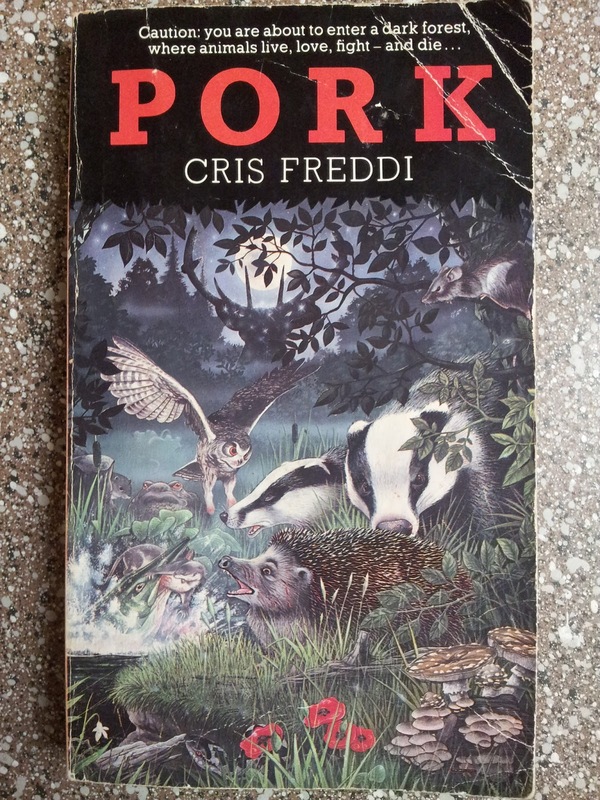 My copy of Pork, featured at the left, was released in 1983. The artwork is fun -- I purchased this novel from the sci-fi/fantasy section at my local bookstore. I hunted down Pork after looking up "humorous fantasy novels" on the Internet, and I think I found this title on a Goodreads list somewhere. Sci-fi and fantasy aren't usually my go-to genres, but when I do read fantasy, I tend to enjoy the goofy picks. Cris Freddi's Pork is comprised of several short stories about animals living together (inharmoniously) in a forest. The first chapter is entitled "Pork," about an insecure hedgehog living in the woods. The second chapter is called "Mon," about an extremely old and mean owl who eats other owls like a nasty old cannibal. The third chapter is about an ugly grey squirrel named Rusalka who searches for true love, and so on and so on. The animal characters interact with one another off and on throughout the novel, and end up sticking together at the end of the book to defeat a bullyish crocodile. The novel sounds fairly cute, doesn't it? But it actually isn't. Pork wasn't funny, wasn't humorous, and was honestly quite annoying. Most of the short stories featured animal characters who were "old" and complained about being old constantly throughout each chapter. Some of the animals, such as Mon the owl and Ug the giant toad even complained about having weak muscles and joints, and it was pretty ridiculous. The characters' senility and oldness became a running joke as I neared the end of the book. I'm sure the author was trying to point out that all predators eventually become old and die -- the whole circle of life concept -- but it was just plain silly. The front cover blurb for Pork says, "Caution: you are about to enter a dark forest, where animals live, love, fight -- and die..."
Upon reading the cover blurb, I thought this book would feature a lovely combination of all those facets, but all the stories were more about fighting and death than love. This novel was only 188 pages long, but it took me an entire week to get through it. The cover artwork is probably the best feature of Pork. I definitely wouldn't recommend wasting your time on this ridiculous novel. According to Cris Freddi's profile at Fantastic Fiction, he's a huge football fan, and has written several non-fiction sports books. Freddi's other fiction novels include The Elder and Pelican Blood.